There are plenty of designs for small backyards out there for every space and lifestyle. When homes get smaller, their backyards usually shrink with them. We’ve taken the top 10 tips for a small backyard design and broken them down here. You can use only one or combine different designs ideas to create space in your small backyard and create the space of your dreams! One of the best ways to create space is to simply use space that you hadn’t used before. This may seem obvious, but there are plenty of places that many homeowners forget about when designing their backyards, decks, and patios. If you plan to do a lot of outdoor entertaining, you may want more finished spaces in your smaller backyard. There are plenty of designs for small backyards that maximize your outdoor entertaining space. One of the most popular is to utilize the space underneath a second floor deck. Under deck patios provide double the amount of finished platforms that can be used for backyard parties. These open areas aren’t just limited to outdoor entertaining functions. If you simply want more storage, there are plenty of ways to incorporate it into the design for your small backyard. If you want to close off the open space underneath your deck, you can create an under deck storage shed. This is the perfect way to keep your structure’s footprint small, but still getting the maximum amount of storage. If you don’t want to take up your entire under deck area for storage, you can create a unique design with in deck storage. Similar to the hidden storage design of trap door storage, you make a small compartment that sinks down below your deck boards. Just like an interior space, creating a flow of traffic can help your backyard to feel larger and less cluttered. Clear organization of your space cuts down on clutter and maximizes your space efficiently. Depending upon how you plan to use your backyard, there are several ways to direct your flow of traffic. Zoning is a major part of the organization of any space. In interior spaces, it’s determined by the furnishings used. 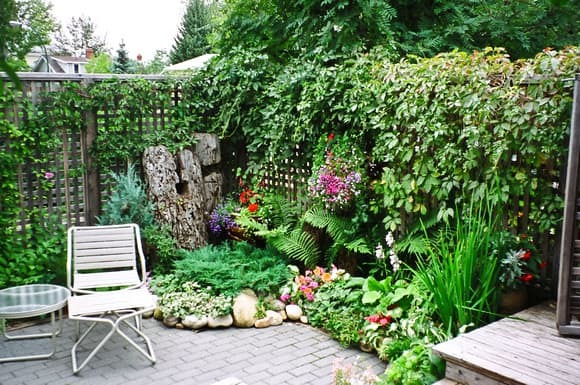 The same can be said for small backyard designs. One of the easiest ways to zone your backyard space is to have a finished platform, such as a deck or patio, and open green space. This natural separation creates different areas in your backyard with different functions. To create a clean flow of traffic from each zone, finished walkways through your backyard is an easy DIY small backyard idea. You can create the pathway that will best fit your home design and lifestyle. Whether you decide to have a finished brick path or have individual pavers in your grass, you will give your guests a clear walkway from section to section in your backyard. If you have a raised deck design, you may want to create an efficient flow of traffic by installing a deck stair. Deck stairs come in a wide range of designs depending upon your home’s design style and how you want to utilize your outdoor space. Traditional deck stairs are the most recognized stair design when it comes to backyards. These stairs are the same design that you would typically find in a home’s interior design. These stairs are usually an all wood design and extend out from the face of your deck into your backyard. However, these stairs do have some drawbacks. The biggest problem with a traditional deck stair in a small backyard is the large footprint. A typical traditional staircase with that will access an 8’ tall deck will extend approximately 9’ into your backyard. Make the best use of your backyard by contacting one of our expert designers to walk you through every step of the stair purchasing process. Request a consultation, or contact us directly at 1-800-368-8280. A spiral staircase is an ideal design for small backyards. The spiral design keeps the staircase’s footprint to a small circle in your backyard. 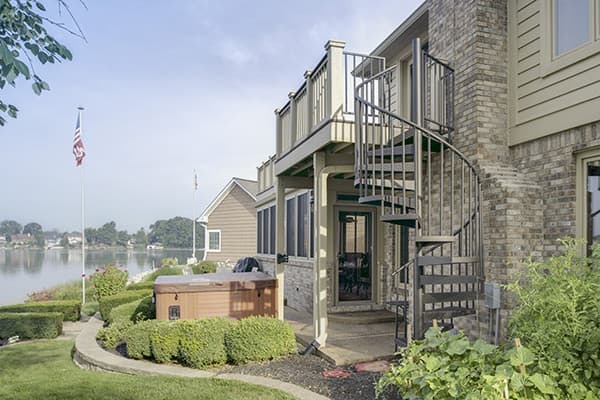 The maintenance free designs of an Exterior Galvanized spiral stair and a Powder Coated Aluminum spiral stair are ideal for homeowners that want to maximize their small backyard without the added stress of upkeep. Not only do built in pieces create one of a kind designs for your small backyards, but they also maximize your available space. 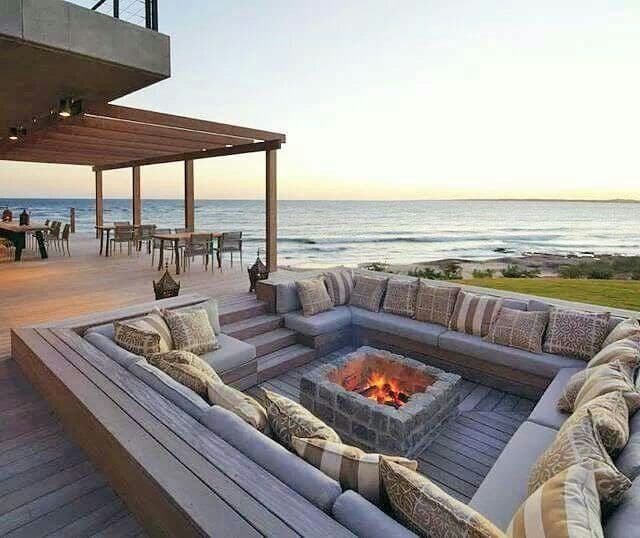 Take advantage of your current backyard structure by incorporating any seating or surfaces directly into the design. This opens up the rest of the structure for other design accents to complement the one of a kind structure. One popular way to incorporate your seating into the existing deck or patio is to build a sunken conversation pit style bench. This unique design is perfect for a raised deck that has some extra space underneath the structure. It creates a truly communal space that promotes conversation and togetherness. If you want to incorporate a built in piece right into your backyard, in ground fire pits are popular DIY small backyard ideas. This weekend project creates a unique space that will be the central focus of any backyard party. While it may seem like an intimidating project, you can easily complete it with the help of a friend or neighbor! One common staple of small space decorating is to build up, not out. The same principle applies to your backyard landscaping. If you have limited space in your backyard, it can be difficult to find the balance between finished and paved space and keeping the space green and full of life. Vertical landscaping is a new development to add green to your space without taking away any of your deck or patio. Green walls are popular in both indoor and outdoor spaces. These panels have the soil incorporate right into the frame to create a moveable garden that has a very minimal footprint. This is perfect for small backyards that may have close neighbors. You can use your green walls to add color to your backyard, as well as provide privacy. 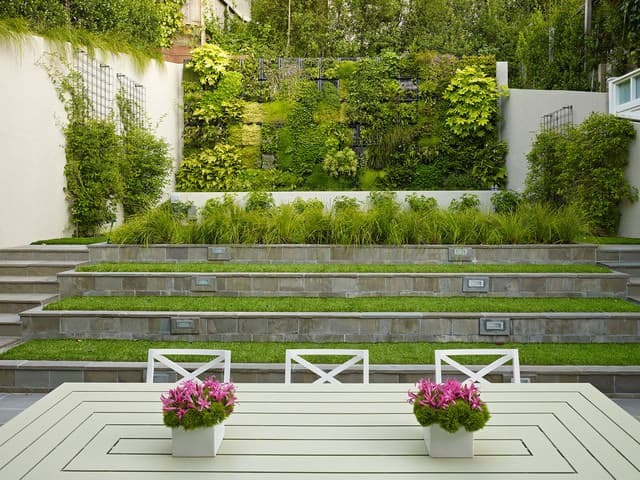 For a simpler vertical landscaping design, you can use a lattice panel with climbing plants. 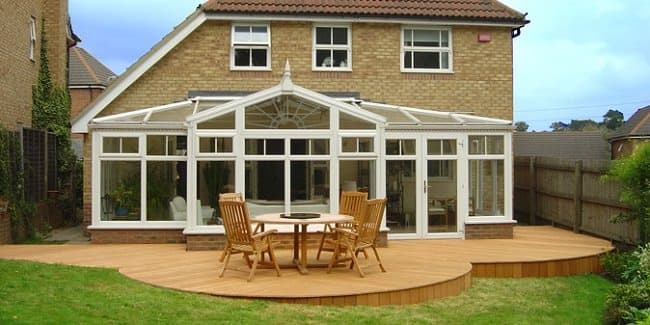 With a wide range of options for your plants, you create a unique garden that will take up no space that you would use for outdoor entertaining. While these may take a little longer to fill out than a green wall, they are a great DIY project for a small backyard. Multifunctional pieces have been used to maximize small spaces. With the emergence of tiny homes and the growing popularity of city micro apartments, multifunctional furniture has come a long way from a futon. These standard indoor designs have been altered to fit into your outdoor spaces. Built in benches, like the ones previously mentioned, have started to be altered to multitask as storage units as well. By adding hinges to the actual seat of the bench, you are able to lift the top to show a space for outdoor cushions and backyard games when they are not in use. Another popular way to incorporate double duty furniture in your backyard is to install a cooler in the middle of your outdoor dining table. 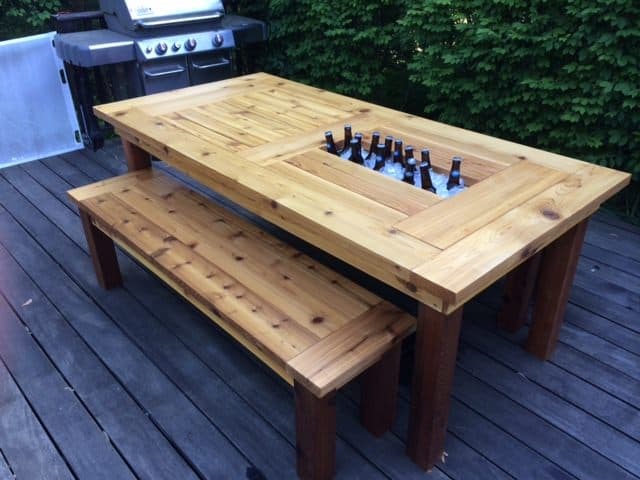 This popular DIY project is perfect for those that plan to do a lot of outdoor entertaining with their space. BY incorporating the cooler into the table, you’re taking it off of the deck floor and opening up that space for more seating or just removing clutter. While some backyards may not be small, their usable space can be limited. This is a typical problem when it comes to sloped backyards. Even if there is plenty of room, a steep slope may seem like it makes your backyard unusable. There are several different ways to design a solution into your space. If you don’t want to have the cost and stress of leveling your entire backyard, a tiered garden can help you use the slope to your advantage. By utilizing the small platforms, not only are you using the slope in a creative way, but you’re also creating natural retaining walls. This is perfect for homeowners that may have an outdoor entertaining space at the bottom of the hill. You can use these small terraces as smaller levels for entertaining, as well. By installing steps between each level, you can safely access the different spaces and not have to let go of any of that space. You can separate them with small walls and use pavers to create a flat stable surface on the slope. When you’re trying to make the most of a small space, don’t be afraid to use unconventional shapes in your designs. A standard square or rectangle may not always be the best design for your small backyard. Experiment with different blueprints and layouts to find the best fit for your home design. Circular designs are a unique way to have a finished platform without taking over your entire backyard. By cutting off the corners of a standard square deck, you can keep some green space and keep your finished deck or patio. Don’t feel like you have to organize furniture or lay your patio in a standard direction either. If you decide to design your backyard on a diagonal, you can trick the eye into seeing a larger space. Sometimes you may not need to create physical space, but rather give off the feeling of a bigger space. Another way to create the illusion of a larger backyard is to incorporate focal points into your backyard design. These focal points create a center focus and helps ease any visual clutter. It also gives you something to build the rest of the design for a small backyard. A popular centerpiece is a backyard fire pit. Not only can you customize a built in design, like the one mentioned above, but you can easily buy a standalone design as well. You can either have an all stone design or use a metal frame from an industrial rustic design. They’re also a popular option due to their long term use that extends beyond the summer. 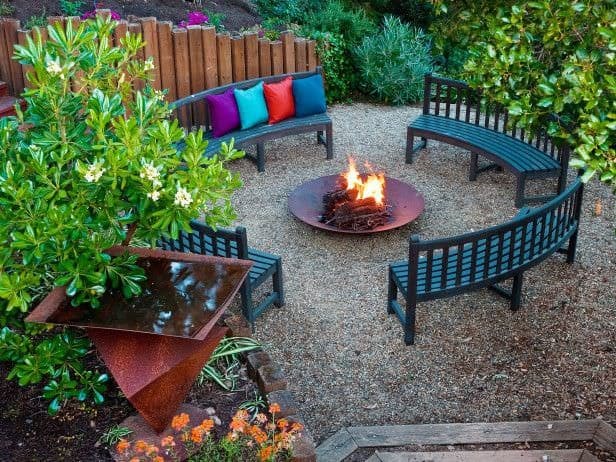 Use the fire pit as the center of a small circular layout for your backyard seating. Water features are another common visual centerpiece in backyards. They add a touch of luxury to an otherwise simple backyard design. They’re commonly found in backyard gardens that are filled with large flowering plants and iron benches or as the centerpiece to an ornately designed English garden. The best way to make the most of a small backyard is to embrace the simplicity of design. You don’t have to completely fill a space to maximize its use. 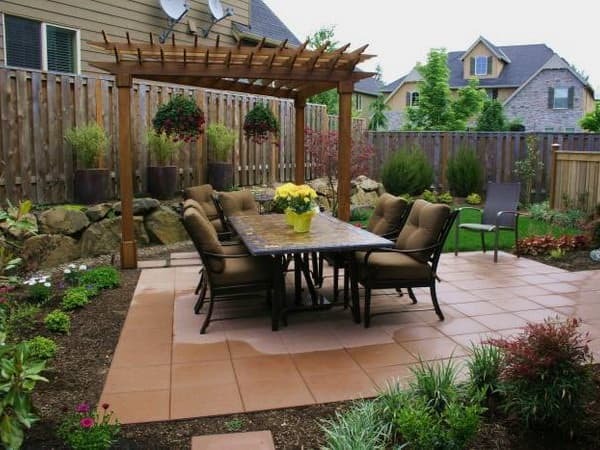 Prioritize the different applications for your small backyard and pick your furnishings from there. Once you’ve decided on how you want to use your space, choose simple furniture that’s proportionate to your space. This means larger, but fewer pieces. A lot of homeowners make the mistake of buy lots of smaller items. This makes your small backyard feel cluttered. You don’t have to pack everything you could possible want into one backyard space. Don’t feel limited by a small backyard! There are plenty of ways to create a beautiful space without a ton of square footage. 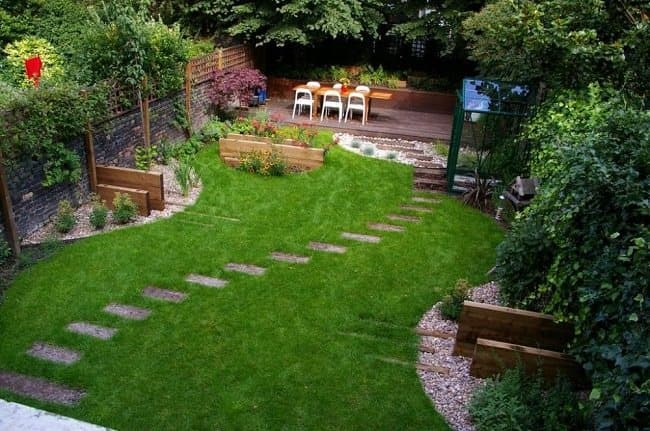 These clever tips are the perfect way to create space using designs for small backyards. If a spiral stair is the right way to create space in your outdoor space, give one of our consultative designers a call to start your project!